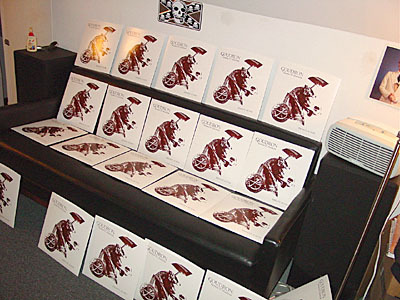 Ersatz Audio is proud to deliver the long overdue initial 12" release from Detroit's Goudron. First introduced on the Ersatz Audio compilation "Misery Loves Company" earlier this year, Goudron now delivers a new 4 song EP of contrived impulses, moving thematically from the harsh to the refined. The "Horses & Chariots" EP provokes contradictory moods, a perfect reflection of twenty-first century living. 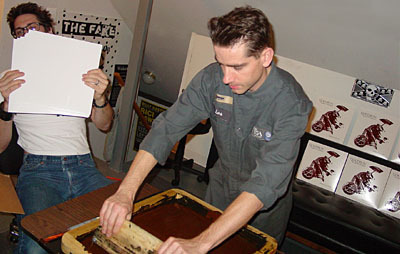 Goudron is Ron Zakrin, Detroit artist and musician. He is represented by Detroit's acclaimed Cpop Gallery for his paintings, and now by the edgy Ersatz Audio label for his music. Known to most Detroiters as Ghost200 (his preceding musical guise), Zakrin has been playing live since 1996. Ghost200's first show was with Le CAR in Detroit. With his long live show history to his credit, Goudron's first EP sounds more experienced than most artists' initial release. Complex rhythms, made from machines customized by Zakrin himself, seem to fall out effortlessly into unique patterns, evenly complimenting the emotionally charged instrumental tracks. "Horses & Chariots" comes complete with an original Zakrin designed 12" jacket. 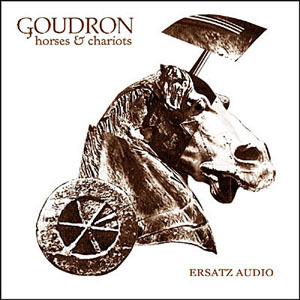 Goudron's dichotomous compositions, wavering between the warm and the cruel, the calculated and the improvident, fit perfectly askew in the lineage of Ersatz Audio. "When it breaks down, the people in the club are going to scream! This is tight. I really love the bass line. If I had a set between 2 and 5 [am], I'd probably drop this around 3." No time to sit while the jackets are drying.